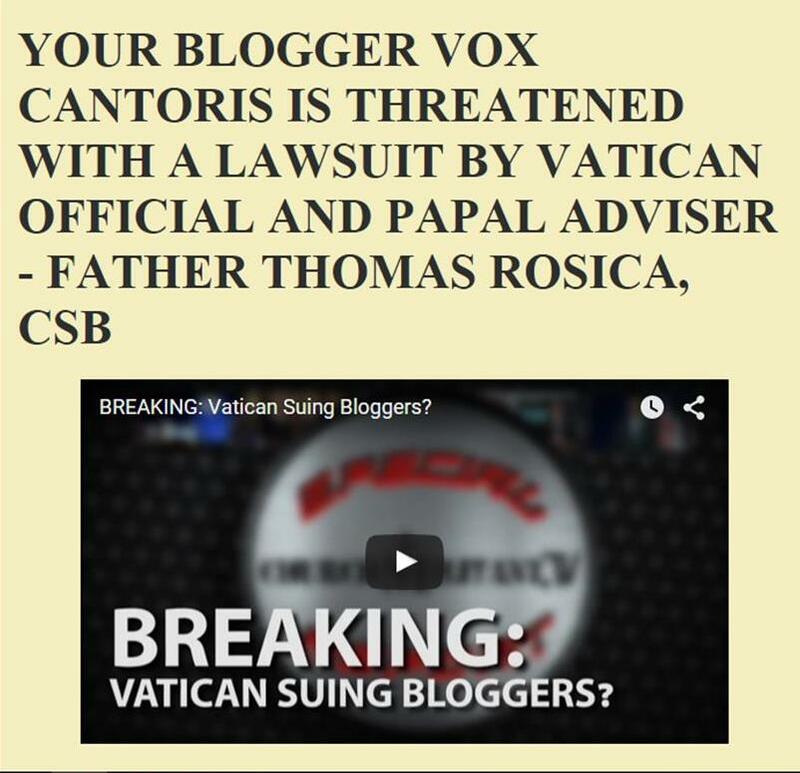 Vox Cantoris: Who is behind the persecution of Father Frank Phillips and the Canons Regular of St. John Cantius? Who is behind the persecution of Father Frank Phillips and the Canons Regular of St. John Cantius? As my dear readers may recall, Father Frank Phillips, Pastor of St. John Cantius Parish in Chicago was removed from active ministry by Blaise Cupich, the Cardinal Archbishop pending an investigation into accusations. That investigation is complete and Father Phillips has been exonerated. Yet, Cupich has prohibited him from public ministry. Oakes writes of the enemies of Father Phillips and the broader war against him and the Canons Regular. He intends to name, names. This community like the Latinist Ryan Grant interprets the Catechisms of Trent and St.Pius X as a rupture with the past exclusivist ecclesiology of the Catholic Church, EENS( Feeneyite) and St. Robert Bellarmine. This community and traditionalists in general, especially those who have had their formation under Archbishop Marcel Lefebvre, interpret the baptism of desire,baptism of blood and being saved in invincible ignorance, mentioned in the Catechisms of Pius X and Trent, as referring to known people saved outside the Church.So they become examples of salvation outside the Church and are objective exceptions to Feeneyite extra ecclesiam nulla salus(EENS). So there is a split with Feeneyite EENS. This is appreciated by the present two popes. All of them do not realize that even a priest who offers Mass in English can affirm Feeneyite EENS and the past ecclesiology without there being a rupture with the past Catechisms or the popes and saints of the past on exclusive salvation in the Church. So the result is, because of this confusion, the traditionalists affirm EENS in a vague and confused way ( I call it EENS (Cushingite) and reject Vatican Council II(Cushingite). They do not know about Vatican Council II (Feeneyite). So the Vatican and the Jewish Left pounce on the traditionalists believeing that they are a rupture with the new ecclesiology based on Cushingite baptism of desire, baptism of blood and invincible ignorance which is important for the one world religion. It was important for this priest and traditionalists in general to show the Vatican and the liberals that they can affirm Vatican Council II and EENS Feeneyite and so be traditional - and this can also be done by priests at every different Rite. Then may be it would be difficult for the Left to target only those who attend the Tridentine Rite Mass. Since even at the Novus Ordo Mass the ecclesiology would be traditional. Not this priest, he is so loved by God he is being given suffering. God is the author of history...we choose to do his will or not. Praised be Jesus and Mary! The Canon Regular is a religious order faithful to the Magisterium of the Church. I am a humble lay person who is edified by their presence. To say that they are in line with breakaway and misguided groups is erroneous and outright wrong. They have regular Novus Order Masses which are done with utmost reverence. The late Cardinal Francis George spoke so highly of this order. Oh dear, look at this. This was a witch hunt from the get go. Keep your eyes on Oaks Spaulding's posts...he will be updating. Oh and PRAY for Fr. Phillips! He's undergoing the passion of sorts. Some of these Bishops are wicked men. So many, both laity and other Priests alike hold Fr. in the highest regard. Fr. Phillips is not only a traditional Catholic Priest but he didn't hold back against speaking of the evils of homosexuality...regularly. Hmm....had he 'touched a nerve'? Cardinal Cupich seems to have a passionate HATE for anything traditional.....for anything authentically Catholic actually. May I remind you all that in his last Diocese he actually locked parishioners and Priests out of their Church on Holy Thursday because he did not want them celebrating the Traditional Mass of which they had planned to do. He also forbade his Priests in marching in the Right to Life March of which there were many planning to do. And.....he ordered his entire Diocese to STAND during the Consecration. They were NOT to kneel. Ha! I would NEVER HAVE obeyed THAT one! No Priest, Bishop, Cardinal or Pope has the right nor the authority to forbid us from adoring and giving honor, and respect to Our Lord in any context let alone in the context of the Holy Sacrifice of the MASS! These things along with all the recent heresies being spewed out by this 'Cardinal' should give people an idea of where this 'Cardinal' is coming from. I don't trust this guy as far as I can THROW him! To use a phrase......He is Cardinal Bernadin reincarnated and I think we all know what kind of damage HE DID. This is the problem with assuming modernists can hold office in the Catholic Church. Cupich is an obvious modernist heretic and has no authority over any Catholic. 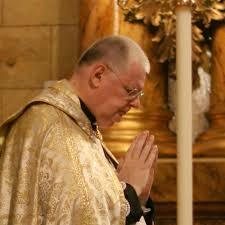 Fr Phillips should have left the Novus Ordo fake church decades ago. Looks like we will never know the details of this whole sordid story. What is being reported is that the 'reason' Fr. Phillips is not being reinstated is because of 'imprudence' or 'lack of right judgement' in a variety of ways. The details of this 'imprudence' of course are of a confidential nature as to not embarrass the witnesses that gave testimony. (the witnesses are not the same as the 'accusers') They figured out right off the bat that these 'accusers were not credible, but to my understanding they also interviewed 'witnesses'. We won't know anything else about this matter. And.....they are kicking around the idea of sending him to 'sensitivity training' for priests. What is 'sensitivity training'? Well, as far as I can surmise it is a cover for 'modernist psycho babble brainwashing'. By now, it's pretty much common knowledge that Fr. Phillips spoke out in defense of Church teaching and on the evils of homosexuality. And......as is also 'common knowledge' Cardinal Cupich is of the opposite 'opinion'. I think we can maybe put two and two together here.....and it's not equal to 5!!! So if Fr. Phillips wins his case according to Church Canon Law or the secular law, he will go back to his community and parish and interpret Vatican Council II with Cushingism instead of Feeneyism, as does Cardinal Cupich. Fr.Phillips instead should ask his Canon Lawyer to ask Cardinal Blaise Cupich to interpret all magisterial documents with rational and traditional Feeenyism, instead of the present irrational and innovative Cushingism.He must ask Cardinal Cupich to come back to the Faith on Vatican Council II ( Feeneyite) and EENS( Feeneyite) and to affirm the Nicene Creed with the traditional theology. Similarly he could ask the secular courts to urge Cardinal Cupich not to lie and use deception to change Church teachings with a false premise. This is the hallmark of Cushingism.This misleads Catholics in general. The Cardinal must admit that Vatican Council II does not contradict the 'strict interpretation' of the dogma EENS, unless,one is using a false premise,mixing up what is invisble as being visible, unknown as being known, hyothetical as being concrete and personally known people, in the present times.This is deception.